Sam joined the DentalVets nursing team in September 2017. 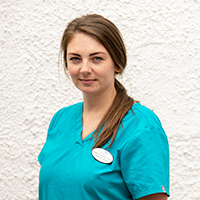 She initially became employed as a Student Veterinary Nurse at a busy small animal practice in West Lothian before graduating as a Registered Veterinary Nurse from The College of Animal Welfare in 2016. She grew up in Dunbar and has returned there after a few years living in Edinburgh. She has 3 dogs - 2 cocker spaniels (Nelson and Lyla) and a Brittany called Ete. Outside of work, she enjoys nice countryside walks with the dogs, travelling and eating out.